Riverhead, NY (USA) -- After a long and varied history of uses, the historic Grange Hall on Sound Avenue in Northville is now slated to become a Buddhist meditation center and community hub. The 186-year-old Grange Hall is in contract to be sold to the Long Island Buddhist Meditation Center, presently located in Port Jefferson. “We’re excited,” Anthony Manetta, a member of the Long Island Buddhist Meditation Center said in a phone interview Monday. The second floor of the two-story building will be devoted to the practice of Buddhism and meditation; the first floor will be used to serve the community, hosting things like AA meetings, he said. The meditation center expects to finalize the sale some time in late April and open on June 1, Long Island Buddhist Meditation Center member Don Jayamaha said. 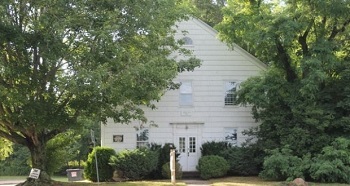 Grange Hall was originally located in Aquebogue and used as a Strict Congregationalist Meeting House. It was moved to its present location in 1834 and served as a church until 1860, when it was converted for use as a school by the Northville Academy, a private co-educational secondary school that enrolled more than 160 students. Over the years Grange Hall has been used as a gathering place for local farmers, a center for dances and social gatherings and a homeless shelter. It is owned by the First Parish Church UCC, which also owns the church across Sound Avenue from Grange Hall. Faced with a declining congregation and exigent financial circumstances, First Parish was in danger of closing its doors for good in 2013 and decided to rent the church building, located on the corner of Sound Avenue and Church Lane, to the Community Baptist Church and conduct its own worship services in Grange Hall instead, its pastor Dianne Rodriguez told RiverheadLOCAL at the time. But the church could not hang on, Rodriguez said in a Feb. 23 interview. Rodriguez relocated to the Portland, Oregon in March 2015, she said. Up until 1972, the church was known as the Sound Avenue Congregational Church. At that time the Jamesport and Sound Avenue Congregational churches decided to merge and First Parish Church was born. Services were held in the Sound Avenue church and the Jamesport Congregational Church, on Main Road in Jamesport, was rented to House of Praise and then the North Fork Unitarian Universalist Church. In 2008, First Parish sold the Jamesport church, which dates back to 1731, to the Jamesport Meeting House Preservation Trust. The Community Baptist Church continues to rent the former First Parish church building.